The "U" in the part number reflects product packaged in poly bag. 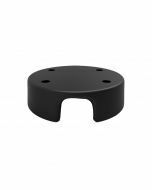 RAM recommends this adapter base for "Rugged Use" mounting applications, including heavy weight Lowrance Elite and Mark Fishfinders. The RAM-201U, standard double socket arm, has a socket at both ends that accommodates 1.5" ball bases. A single spring inside the arm opens the end sockets, allowing you to pivot the ball and socket connection. This socket technology allows for almost infinite adjustment and perfect viewing angles.